Want to be the star of your next outdoor cookout? 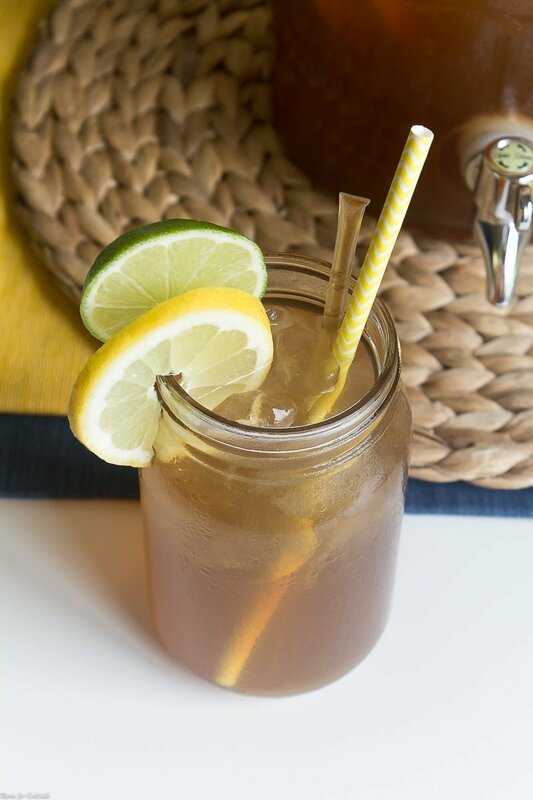 Then serve this Adults-Only Sweet Tea Punch recipe with hints of brown sugar, bourbon, and citrus. After that just sit back and wait for your friends to share their compliments. Life has been a complete whirlwind since moving to Ohio, a fact you’ve read more than once on these pages. I left the midwest 20+ years ago, so this move is a homecoming of sorts. One thing I’ve missed is the beauty of four seasons. Rain, snow, wind, sunshine… you name it, and we’ve had it so far in the last three months! All of these changes make me daydream about warm spring days as a kid, sipping a glass of sweet tea, and counting the days until summer vacation. An icy pitcher of sweet tea was always in the refrigerator. Plus a fresh replacement brewing in the sun on the back porch. Now I spend my sunny afternoons exploring Columbus with new friends. At the end of a busy girl’s day, we love to settle in for a late day snacks and cocktails. The Polaris World Market is a few miles up the road from us, and they have everything you need for a sunny soiree. 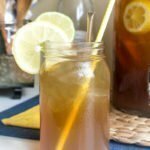 They have the ingredients for my Adults-Only Sweet Tea Punch along with some pretty great items to really personalize your outdoor gathering. I am in love with mixing blues and yellows this season. They remind me of a blue sky on a sunny afternoon. Which helps when you live in Ohio and it suddenly rains out your at-home happy hour! Before the rain really started to pour, luckily we were able to relocate our sweet tea setup inside. This adorable mason jar caddy from World Market is a great cookout asset. 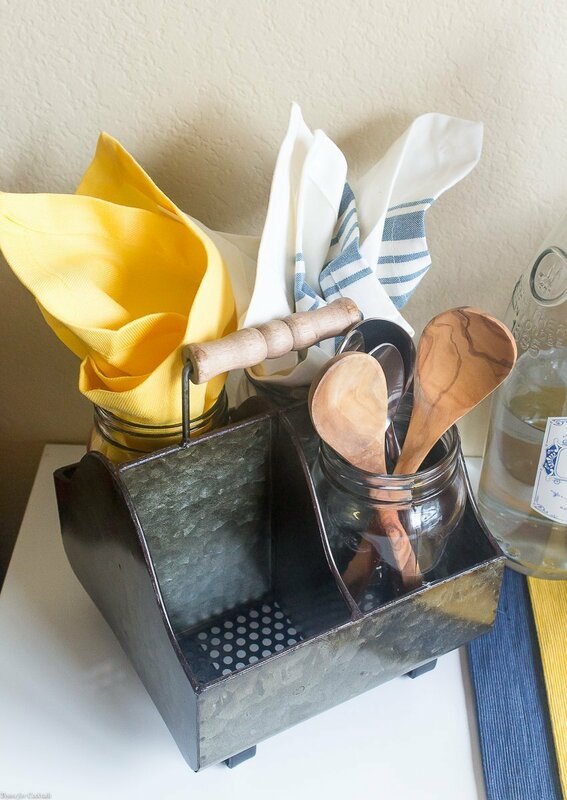 You can use the jars for drinks like my Adults-Only Sweet Tea Punch recipe, a refreshing mocktail version, or even as a utensil caddy. The gals were a little bummed until we had a little impromptu alcohol infusion Q&A. A great way to add flavor to your drinks without the extra calories and additives is to infuse a basic liquor like vodka with ingredients such as vanilla, cinnamon, or orange. I love to play around with spicy peppers, black peppercorns, and different flavors of tea. Teas are a great infusion for beginners because it already has layers of flavor built-in. Just don’t steep too long. The alcohol can take as little as a few hours to extract the teas essence. Also I like to use a tea filter so that it is easier to remove any bits of matter from the alcohol before drinking. 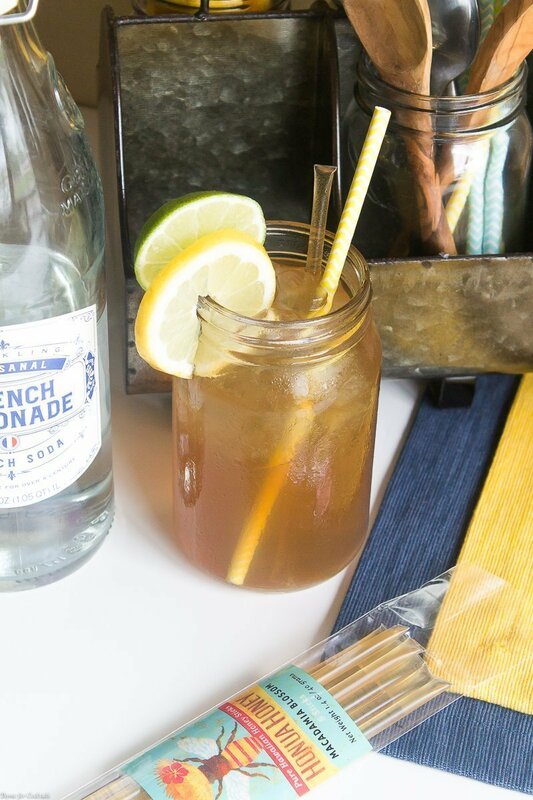 I made a bourbon infused with orange for this Adults-Only Sweet Tea Punch recipe. It balances nicely with brown sugar and citrus in a velvety smooth black tea. 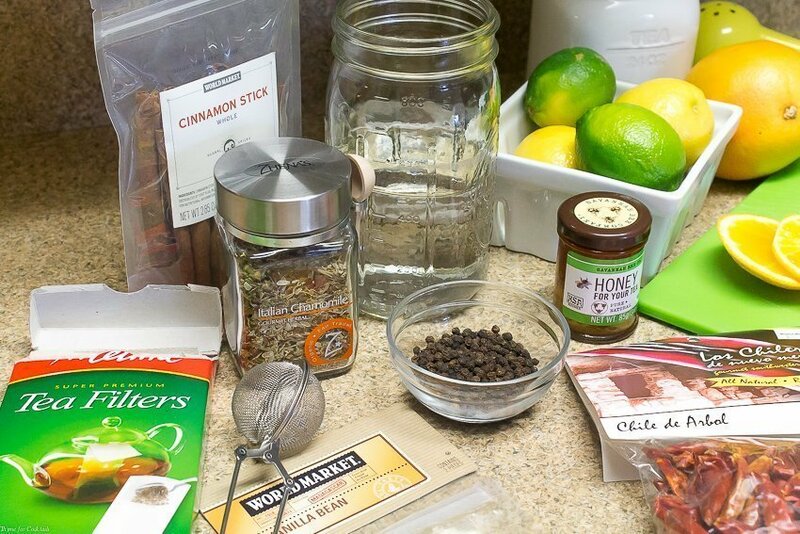 You can be really creative with the add-ins when you make a sweet tea punch. Make this recipe into a summery mocktail by substituting the bourbon with your favorite fruit and sparkling soda. Honey is another fun sweetener to use. 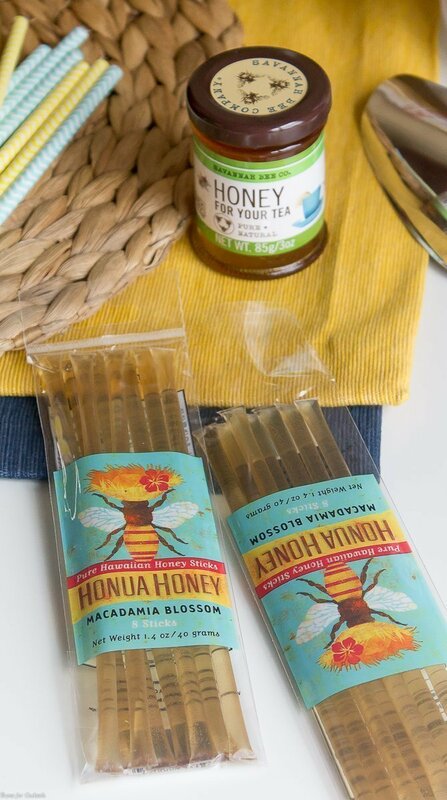 These honey sticks make great garnishes! 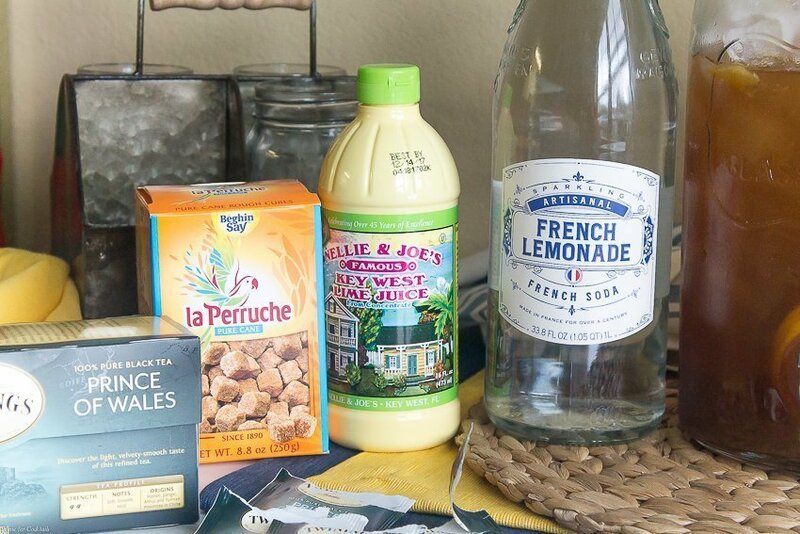 Another great summer cookout idea is this refreshing mocktail recipe by Lifestyle Expert Brandi Milloy can be prepped the night before or minutes before the guests arrive. Simply mix the cucumbers, mint, frozen limeade, sparkling water, and cucumber mint lemonade in a drink dispenser and add ice right before serving. Display your glassware and straws within easy reach and clearly label each refreshment for a self-serve bar that gets the party started right. Read more here. 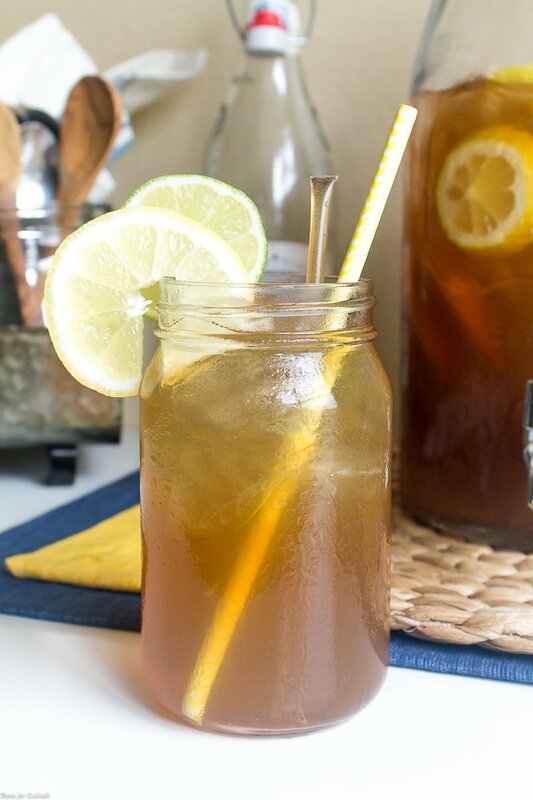 Drink bars way for guests to customize cocktails like this Adults-Only Sweet Tea Punch recipe. You can add different flavored sodas, fresh fruit, or even a spicy simple syrup your friends can mix to their drinks. I used a combination of lemons, limes, and oranges to compliment this recipe. Other creative options would be pineapple, peaches, or even fresh cherries! What childhood memories inspire you to create new recipes? 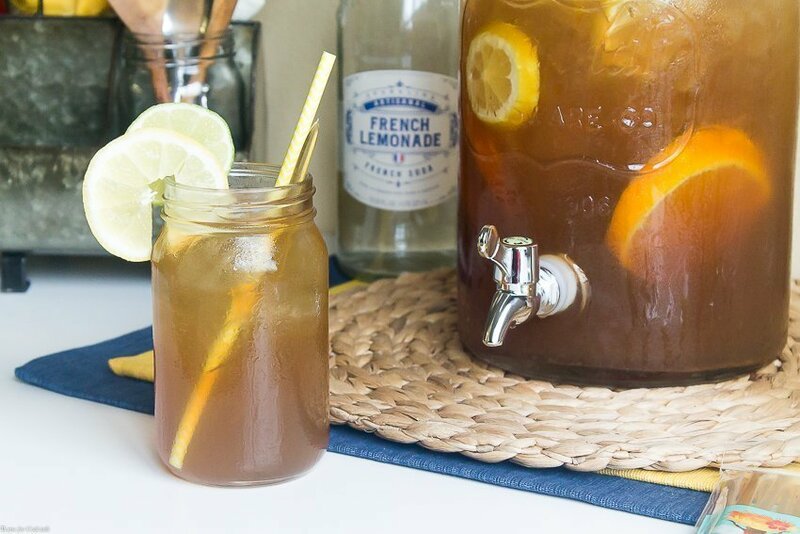 How would you customize this Adults-Only Sweet Tea Punch recipe? Place bourbon and orange zest to a lidded jar. Place in a cool dark place for 1-3 days until desired taste is achieved/ Remove zest and strain, discard fruit. Bring 6 cups water to a boil in a large saucepan. Stir in brown sugar cubes until dissolved. Add tea bags and remove from heat. Let steep until completely cool. 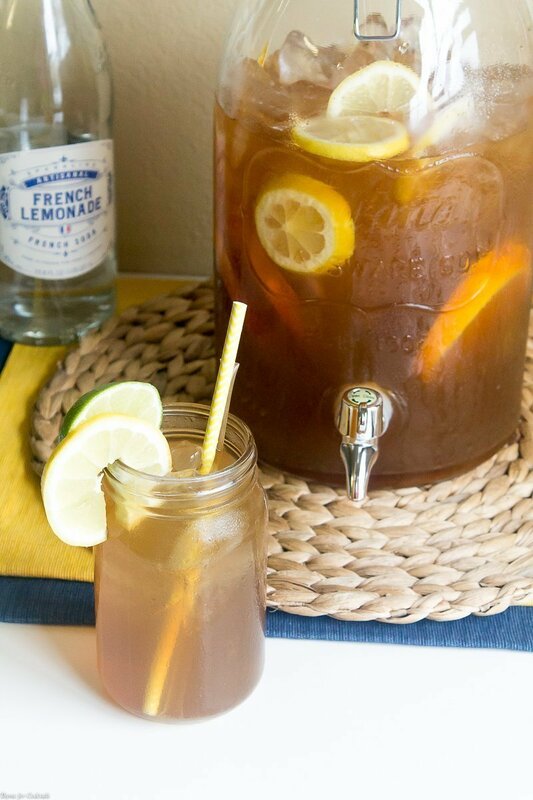 Add sweet tea, bourbon, lime juice, and juice of 2 lemons to a large pitcher filled with ice. Stir to combine. Sweeten with honey to desired taste. Slice remaining lemons. Add fruit to pitcher, reserving a few slices for garnish. Top punch with sparkling lemonade and serve immediately in chilled glasses filled with ice.